My purple leafed sage, which I grow each year as a foliage plant, is in good company, according to my latest gardening library book. In 'Garden Favourites - Designing with Herbs, Climbers, Roses and Grasses' this humble herb occupies a quarter of the colour cover! I love this plant. I treat it roughly as a perennial, while always taking cuttings and preparing fresh new plants. Many of my borders have swathes - perhaps 'clumps' is a more accurate word - of purple sage near their edges. Beautifully clear sky blue flowers cover my plants in summer. 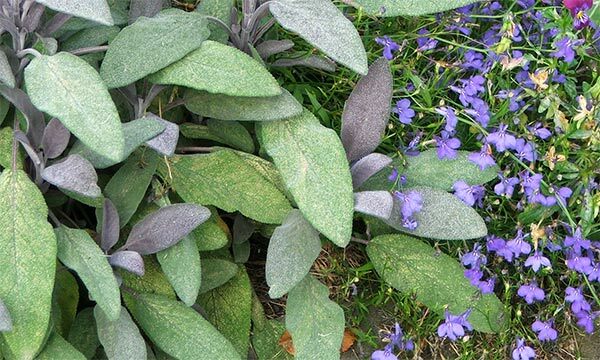 Purple sage is oh so easy to propagate and keep tidy. Thanks, purple sage, for being so generous and relaxed in my garden. The gardening library book 'Garden Favourites - Designing with Herbs, Climbers, Roses and Grasses' is written by Warren Schultz, Rebecca W. Atwater Briccette, and Rick Drake. The authors are American garden writers, and it's published by MetroBooks. It shows some wonderful planting combinations using herbs in the garden landscape - I'm inspired!